I love thinking of ways to disguise Comprehensible Input as a game. I load them up for as long as I can with CI, and then when they’re getting tired, I switch it to a game and carry on with the CI. I’m sneaky like that. At my school we haven’t completely abandoned thematic units and I came up with this little game as a way to give them lots of input and repetitions for clothing vocabulary and the verb “wears”. It ended up being so fun that we played it a lot last year. And what’s even better? It’s a Zero Prep game! Hallelujah! 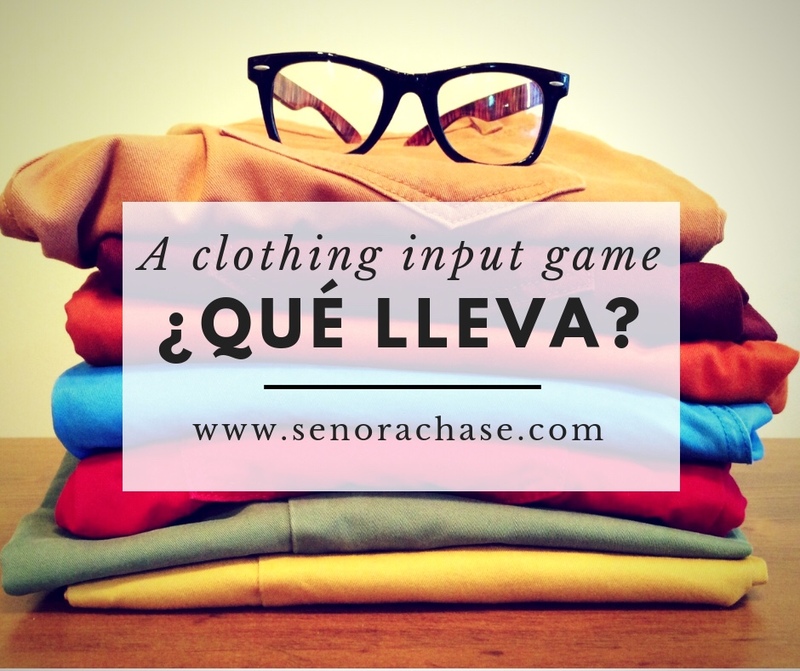 To prep: Think to yourself, I think I’ll play the ¿Qué lleva? Clothing game. That’s all. Move on with your life. The person in charge selects a student and the entire class has to know who that person is and notice what they’re wearing. Then the teacher steps back in and all the students stand up. Let the input commence! The teacher asks yes/no questions with the goal of figuring out who the Secret Student is, based on what they’re wearing. Is the student wearing blue jeans? So…this student is wearing blue jeans. Is the student wearing white shoes with their blue jeans? Teacher says. Ok, if you are wearing white shoes, please sit down. Is the secret student Shelby?! If Shelby was the Secret Student, the teacher gets 1 point. If Shelby was not the Secret Student, the class gets 1 point. Then the teacher goes outside again, the students select another Secret Student and the game begins again. Play 3-4 times and then play again the following class. They’ll get lots of reps of “is wearing” and as many clothing articles as you want to focus on. I love this game because you’re totally in control of the input and they think they’re trying to outsmart you! Sneaky, sneaky CI teacher! Brilliant. Absolutely brilliant! Guess Who in 3-D!!!! Ohh! That would be a great name for the game…mind if I use it!? What a great idea! I have small classes (9 to 15). Do you think I should have to guess in 5 questions because there aren’t as many students to choose from? Yes! Play with it to fit your classes. My colleague just played and added another fun element…she made a little wager with the class… Do you think I can guess it in 8 guesses? Do you think I can guess it in 6 guesses? That might be fun to play with!! Let me know how it works with small classes! AnnieMarie, I happen to stumble across your site and I’m glad I did! Some of my colleagues want to implement FVR (free voluntary reading) and we don’t get classroom money. I teach in NY…I have classes as large as 28. Any suggestions on options that may be more economical? I thought I doing book clubs in groups of 4? I could buy 7 books @ $7 a book out of my own pocket! You’re wonderful and very creative! Ask your friends and family via email/ Facebook to sponsor a book for your classroom and put a sticker in each book recognizing the sponsor. Check to see if your PTA or Ed Foundation has funds for a project. Building literacy would be a hard project to say no to!! Grants! I don’t have any experience writing them but I’ve heard lots of CI teachers getting grants to fund their libraries. Maybe ask your principal- even if there’s “no classroom money”, it couldn’t hurt to ask!! Or can you ask your school librarian to order Spanish readers out of their budget? And I think Book groups would be a great way to start! Good luck with your library! Let me know how it goes! !